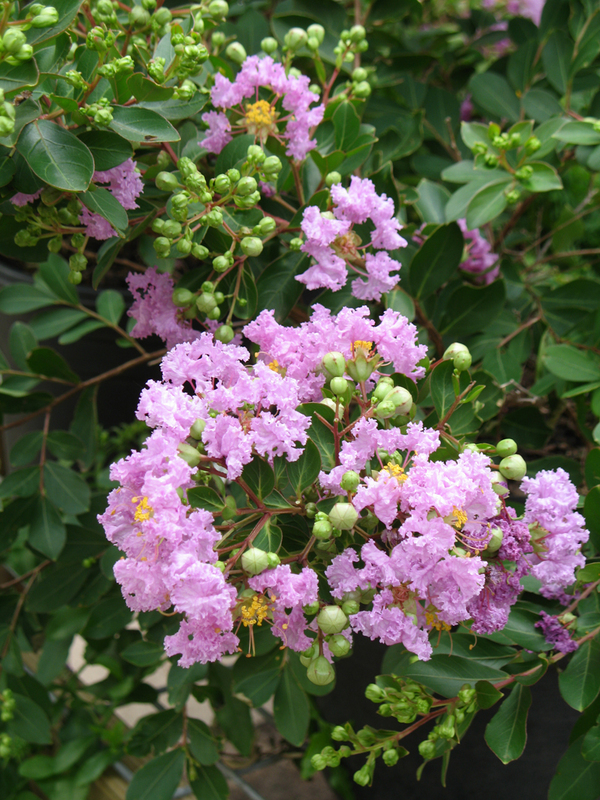 Crapemyrtle is a classic blooming shrub and small tree in landscapes across the state of Texas. It’s long blooming season and ease of care makes it a popular choice for home gardens and municipal plantings. Crapemyrtle performs best in a full sun location. It likes neutral to slightly acidic, well-drained soil. In very alkaline or salty soil, it may show burnt leaf margins or chlorosis or both. Water regularly when young. Plants are drought tolerant once established, but do best with occasional deep watering in order to encourage good blooming. Do not water from overhead. This tree may produce suckers and self-seeds readily. Once planted, it does not like to be moved. There is a big size range available in crapemyrtle varieties; make sure to select the right variety for your intended space. Too often, a varieties that will get too large for the space are planted, only to be severely cut back once mature. Remove dead wood and old seed pods in spring. Shearing plants back (also referred to as “crape murder”, will not encourage more blooms; it will however, ruing the beautiful natural form of the shrub as well as cause large knots at the point of hard pruning. L. indica bears showy clusters of ruffled, crepe-like flowers in white, red, pink or purple all summer. The bronze-tinged, light green foliage ages to dark, glossy green in summer and turns yellow, orange or red in fall. The gray-brown bark exfoliates to reveal the pinkish bark beneath. Many cultivars are available, ranging in size from 2-feet tall to 25-feet tall. ‘Dynamite’ and ‘Arapaho’ are popular red cultivars; ‘Baton Rouge’ and ‘Dallas Red’ are popular pinks; ‘Catawba’ is an excellent purple; ‘Acoma’ and ‘Natchez’ are stellar whites. There are also new cultivars on the market that offer purple foliage, such as the Black Diamond™ series, ‘Delta Jazz’ and First Editions® series.